This year is shooting out of the gate and I'm doing my best to get it together and keep up. My list making is in full force. The sewing machine is tuned up and ready to rock. I've already started off 2010 with some powerful mojo on my side. 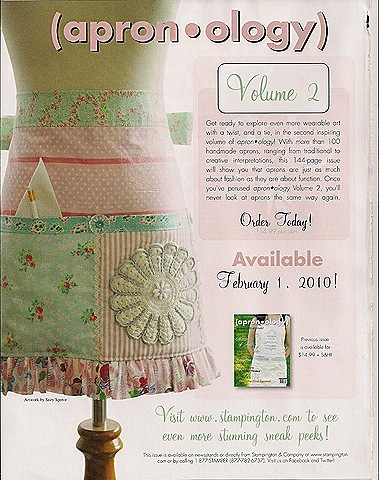 I've got two aprons to be featured in the upcoming Vol 2 of Apronology. I have a purse to be featured in the next issue of Haute Handbags. But this is my favorite of all. For those of you who know me, I haven't changed my name. There is just a little typo in the spelling of my last name in the ad. Oops. I'm still and always will be GeorgiaPeachez, aka Suzy Spence. That is really beautiful! Oh, how did they misspell your name, I can’t read it. Congrats! That is so awesome. You are so talented and so deserving! Absolutely fabulous!!! I like hearing success stories like this, good for you. It is a beautiful apron. Awesome, Suzy! What a great start to the new year. Congrats! What a great way to start the year! You Go Girl! Congrats, I love that apron. Keep the good vibes going. How dumb am I to have seen the ad and not put the two and typo together! How cool, Suzy, and congrats! WOW !!!! Congratulations !!! How EXCITING !!! LOVE that apron!!!!! LOVE your apron…can’t wait to see the rest of the magazine! Suzy, This is so well deserved! Congratulations to you and to them for noticing your talent. Your work is so original and interesting, not to mention artistic and fun. I am very happy for you! Oh Suzy girl, it’s absolutely beautiful! A work of art. Congratulations you talented gal you! Wow,so happy that I “know” someone in Apronology. I have always loved that magazine. Now, it will be even better. Can’t wait til’ it comes out and I can go buy it. yay! That is so super cool Suzy. HUGE congratulations to you!! When I saw this apron in a magazine last month I thought it might be you but I wasn’t sure if that was your last name – now I see it was a typo. Pretty apron and congrats! Congrats!!! I’ll be looking for those issues!! !